Readers question: what are the advantages and disadvantages of devaluation? Devaluation is the decision to reduce the value of a currency in a fixed exchange rate. A devaluation means that the value of the currency falls. Domestic residents will find imports and foreign travel more expensive. However domestic exports will benefit from their exports becoming cheaper. Exports become cheaper and more competitive to foreign buyers. Therefore, this provides a boost for domestic demand and could lead to job creation in the export sector. A higher level of exports should lead to an improvement in the current account deficit. This is important if the country has a large current account deficit due to a lack of competitiveness. Devaluation is a less damaging way to restore competitiveness than ‘internal devaluation‘. Internal devaluation relies on deflationary policies to reduce prices by reducing aggregate demand. Devaluation can restore competitiveness without reducing aggregate demand. With a decision to devalue the currency, the Central Bank can cut interest rates as it no longer needs to ‘prop up’ the currency with high interest rates. Aggregate Demand (AD) increases – causing demand-pull inflation. Firms/exporters have less incentive to cut costs because they can rely on the devaluation to improve competitiveness. The concern is in the long-term devaluation may lead to lower productivity because of the decline in incentives. 5. If consumers have debts, e.g. mortgages in foreign currency – after a devaluation, they will see a sharp rise in the cost of their debt repayments. This occurred in Hungary when many had taken out a mortgage in foreign currency and after the devaluation it became very expensive to pay off Euro denominated mortgages. It depends on the state of the business cycle – In a recession a devaluation can help boost growth without causing inflation. In a boom, a devaluation is more likely to cause inflation. If the country has lost competitiveness in a fixed exchange rate, a devaluation could be beneficial in solving that decline in competitiveness. Type of economy. A developing economy which relies on import of raw materials may experience serious costs from a devaluation which makes basic goods and food more expensive. In 1992, the UK was in recession. 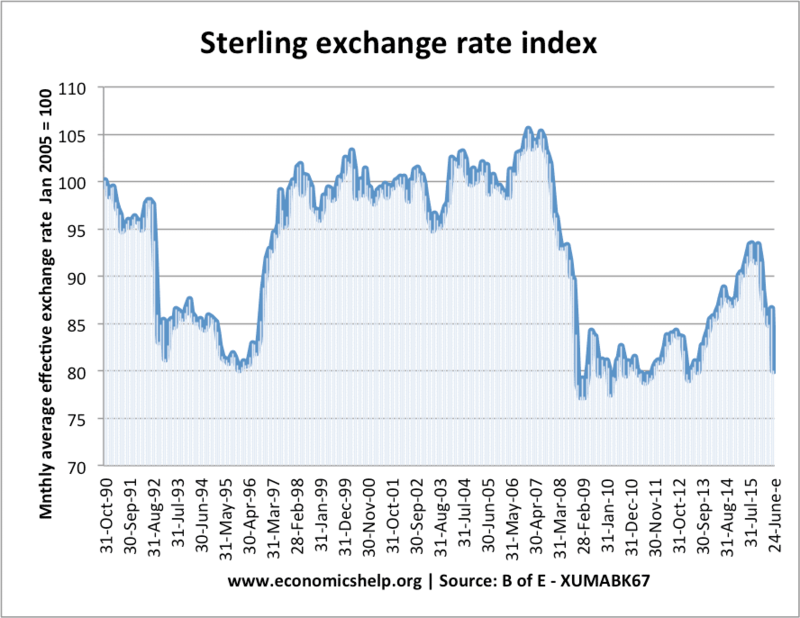 Trying to keep the Pound in the ERM, the government increased interest rates to 15%. When the government left the ERM, the Pound devalued 20%, but more importantly, it allowed interest rates to be cut, and the economy recovered. This is widely considered to be a beneficial devaluation. An important note is that the Pound was overvalued in early 1992. The pound fell considerably after the financial crisis of 2008/09, the depreciation in the Pound made UK goods more competitive. It also caused some cost-push inflation. The benefits of this depreciation were muted because of weak export demand in the global recession. 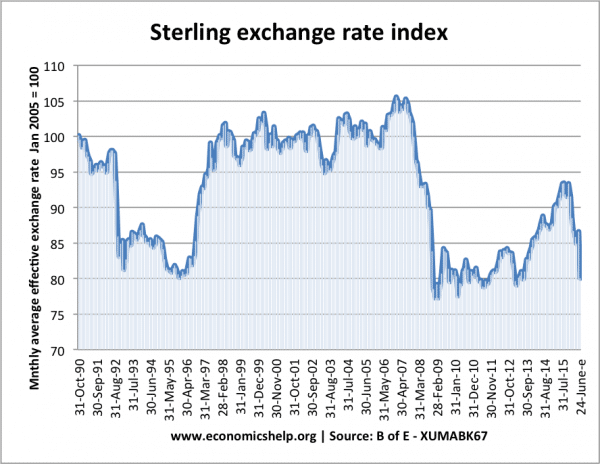 The depreciation in the Pound also caused imported inflation, which during a time of low wage growth, reduced household living standards. Between 2007 and 2018, UK prices rose 30%, compared to 17% in the Eurozone. 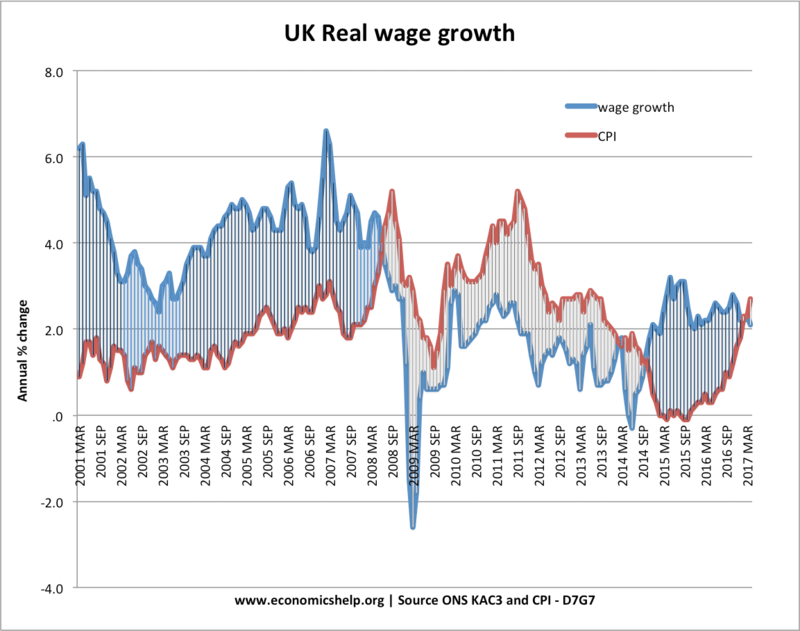 With low wage growth, imported inflation has led to periods of falling real wages. 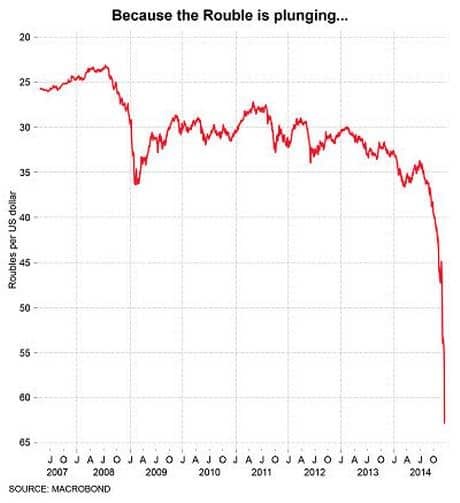 The Rouble plunged during the economic crisis. This was due to fall in price of oil and balance of payments problems. The scale of this devaluation was not helpful – causing a rise in inflation and decline in living standards. The problem was not so much the devaluation as the fact the economy was reliant on oil exports – so when oil prices fell there was a significant fall in demand for the Rouble. See: Fall in value of the Rouble – an example of the impact of the devaluation in the value of the Rouble on the Russian economy. A long-term devaluation tends to reflect an underperforming economy. Note: See explanation on the technical difference between devaluation and depreciation. Does a devaluation really help the economy? one of the disadvantage of devaluation is:A large and rapid devaluation may scare off international investors. It makes investors less willing to hold government debt because it is effectively reducing the value of their holdings. Can it work to developing countries? are effect of devaluation are same for both countries like EU and china? In a nigerian contex where exports are completely raw materials; does devaluation has any significance at all? Yes, if exports are raw materials, they are more likely to be price inelastic. Therefore, a devaluation, which makes exports more competitive will only lead to a smaller % increase in demand. Am sory to say that devaluation has no significant positive impact on the Nigerian economy.its disadvantage is more felt and therefore not good in our context.we havnt significant export to enjoy devaluation. My name is Tandaika Michael am studying at saut in Tanzania. I like to visit this site, but can we specify exactly the roles of devaluation in country’s economy?? What does it mean when the peso is depreciated?